MCCA® thanks freelance writer Rachel Ray for her work in the preparation of the article, analysis of the survey results, and related research; Vicki Richardson, Esq., for completing the survey of 1,000 companies to compile data on race/ethnicity and gender of the general counsel; and Patrick Folliard for authoring the profiles of the three minority general counsel featured in this article. 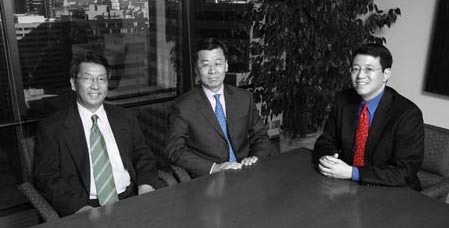 (Left to Right): Simon Leung, General Counsel and Corporate Secretary of SYNNEX Corporation; Hyun Park, Senior Vice President, General Counsel, PG&E Corp; and Ivan Fong, Executive Vice President and Chief Legal Officer, Cardinal Health, Inc.
Corporate America fared extraordinarily well in 2006, despite national and global turmoil. Returns rolled in to America’s largest corporations in record proportions. Indeed, according to FORTUNE magazine,1 American companies are more profitable now than in any period in the Fortune 500’s 53-year history. Thirty-eight general counsel of color stand at the legal helm of Fortune 500 companies. And even more so than in 2005, the unprecedented returns of the past year might offer a compelling case for diversity in corporate legal departments. Minority general counsel account for just 7.6 percent of the Fortune 500, but the companies to which they contribute their talents and leadership earned over $1 trillion in revenues in 2006—10 percent of the total. Of these 38 companies, 28 rank among the Fortune 250. Twenty had revenues between $5 and $20 billion, while 16 boasted revenues greater than $20 billion. 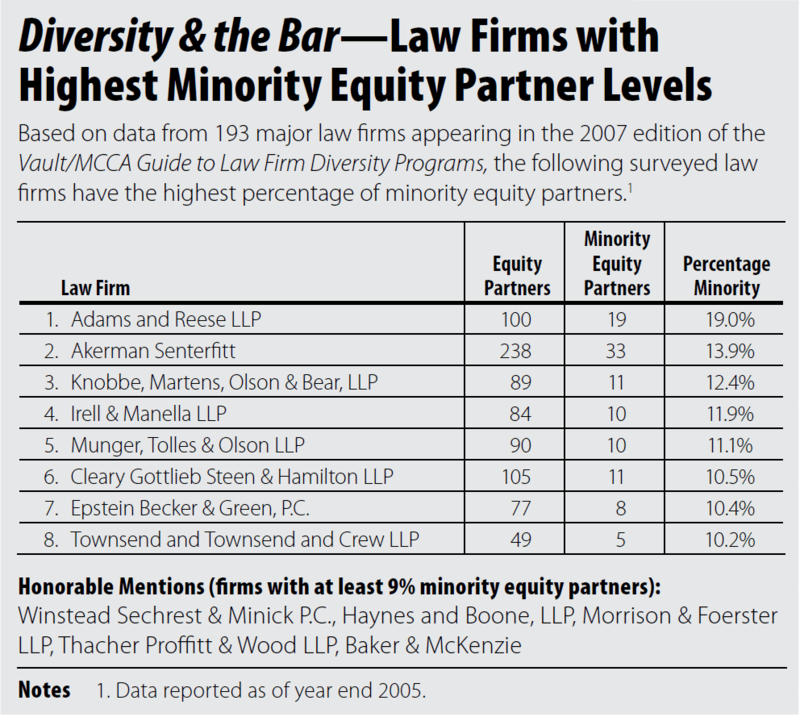 How do the 38 companies led by minority counsel fit into the most profitable company categories? Are the companies in this elite group followers or mavericks? As mentioned, sectors like energy, insurance, and financial services are the highest performers among the general Fortune 500 for 2006. This year’s minority counsel-led group has only one oil company (Chevron); by contrast, minority counsel led four insurance/finance companies (MetLife, TIAA-CREF, Safeco, and KeyCorp). Other sectors offering the most opportunities to minority leaders are food/consumer products (six), electronics/office equipment (five), and chemicals (three). Nevertheless, many other industries are represented, including health, pharmaceuticals, farm equipment, internet services, railroads, motor vehicles, and home builders. This diverse array of business sectors shows that minority counsel have succeeded in companies working across the economic landscape. Their talents have not been confined to industries such as energy and financial services, in which stellar success has been a given over the past number of years. It can be viewed as a positive attribute of corporate America that the work of minority counsel has not been pigeonholed to “safely” profitable industries. Of special interest are three companies that appear on Fortune’s “Top Companies” list5 for fastest-growing profits in one year. This list includes Circuit City Stores (with no major global activity), as well as Google Inc. and AmerisourceBergen (both of which have substantial international business).6 In respect to the presumed impact of international operations, Google Inc. is an extraordinary model. As noted in last year’s report, Google Inc.—led by General Counsel David Drummond, who remains the company’s top legal officer—was one of three companies in which sector earnings grew more than 125 percent in 2005, creating a new Fortune category called “internet services and retailers.” Google, which ranked number 541 in 2005, jumped up to 353 on the 2006 Fortune 500 list, and this year made another huge leap to 241. Sixteen (42.1 percent) of the minority counsel group came to their jobs from another corporate position. Thirteen (34.2 percent) came from law firms. Eight (21 percent) were promoted from in-house positions, and one came from a think tank, the Brookings Institution in Washington, DC. Similar to the trends shown by Fortune 500 women general counsel (as reported in our last issue), general counsel of color are spread throughout the continental United States. The highest concentrations are in California (eight), Illinois (five), and New York (four). A demographics comparison to MCCA’s 2006 report shows both growth and regression. Among all minorities appointed to chief legal officer positions during the past year, Asian Americans garnered the biggest increase in representation. Twenty-two African Americans (57.9 percent of all minorities) serve as general counsel in the Fortune 500, one fewer than the 23 (71.9 percent) reported last year; twelve Asian Americans (31.6 percent) serve as general counsel, which is double the number who served in 2006 (six, or 18.7 percent); and the number of Hispanic general counsel remained constant at three (7.9 percent this year; 9.4 percent last year). When Don Liu (now Xerox’s general counsel) was first appointed in 1999 as general counsel of IKON Office Solutions, Inc., he was alone at the top as Fortune 500’s sole Asian American general counsel. Since then, the Asian Pacific American (APA) legal community has achieved significant gains, particularly inside the “C-Suite” of some of the country’s most prestigious companies. In 2006, the National Asian Pacific American Bar Association (NAPABA) embarked on its ambitious “10x10 Initiative,” with the goal of having 10 Asian American general counsel in the Fortune 500 by 2010. With the several appointments made during the last few months, the APA community has reached this milestone more than two years earlier than projected. In fact, three Asian American women were appointed general counsel in 2007 (Sandra Leung at Bristol-Myers Squibb; Wendy Shiba at KB Home; and, as acting general counsel, Carol Lam at Qualcomm). Currently, twelve Asian American attorneys serve as the “top lawyers” of Fortune 500 companies, which is double last year’s number. In addition, another seven serve as general counsel of companies appearing in the Fortune 501–1000 ranks. MCCA joins NAPABA in congratulating the APA legal community in reaching these heights! One Native American general counsel, J. Michael Hemmer of Union Pacific, appears on this year’s list; in previous years, Mr. Hemmer declined to disclose his heritage. Also confirming his ethnicity for the first time in our survey is Hispanic general counsel John Attaway of Publix Super Markets. The success story of Asian American general counsel in the Fortune 500 (see insert this page) merits special attention. As reported in the July/August 2007 issue of Diversity & the Bar,® Sandra Leung of Bristol-Myers Squibb Company was the first Asian American woman general counsel to join the ranks of the Fortune 500; on the heels of that historic achievement, Wendy Shiba has joined Ms. Leung in this group with her August move from PolyOne Corporation (#713) to KB Home (#228). Another Asian American woman, Carol Lam, was appointed acting general counsel of Qualcomm in August. Only four departures from the 2007 Fortune 500 list were made by minority general counsel. At Home Depot, Frank Fernandez, who resigned for undisclosed reasons,8 was replaced by a white male. Kellye Walker left BJ’s Wholesale Club, Inc. to accept a position as general counsel of Diageo North America; she was succeeded at BJ’s by a white male. Joyce E. Mims left Ryerson, Inc., and was replaced by a white woman. And ServiceMaster dropped in the rankings from 494 to 534 on the Fortune 1000 list; Jim Kaput remains the general counsel of the company. Unfortunately, a huge disparity in gender continues among Fortune 500 general counsel of color, making the group’s demographics far from representative of the general population. Thirty-one (81.6 percent) of the general counsel on the list are male; only seven (18.4 percent) are female. Of the 31 men, 19 are African American, two are Hispanic, nine are Asian American, and one is Native American. Of the seven minority women general counsel, three are African American, three are Asian American, and one is Hispanic. This year’s Fortune 1000 list shows a decrease of three in minority general counsel. In 2006, 24 general counsel of color were in this group; this year, there are 21. Nine companies that had minority general counsel in 2006 have dropped off the list, and only six new companies have filled those vacancies. At one of the nine companies, a white female replaced a minority general counsel. And at two of the companies, white males replaced minorities. Five other companies dropped from the Fortune list. And, as noted earlier, Wendy Shiba’s move from PolyOne to the Fortune 500-ranked KB Home resulted in another minority general counsel departure from the Fortune 501–1000 ranks. The six newcomers to the list include two African American males, one Hispanic male, one Hispanic woman, and two Asian American males. They are Jim Kaput of ServiceMaster (a Fortune 500 company in 2006), Ana Rodriguez of Molex, Arnold Pinkston of Beckman Coulter, Keith Williamson of Centene, Miles Cortez of AIMCO, and John Kuo of Varian Medical Systems. The relatively balanced racial distribution among newcomers is a departure from last year’s group, in which three of the five new minority general counsel were of Asian descent. The racial breakdown for this year’s Fortune 501–1000 group is as follows: nine are African American (42.7 percent), seven are Asian American (33.4 percent), and five are Hispanic (23.9 percent). By comparison, last year’s group of Fortune 501–1000 general counsel had eight African Americans (33.3 percent), ten Asian Americans (41.6 percent), and six Hispanics (25 percent). By gender, 16 minority males (76.2 percent) and five minority females (23.8 percent) serve as general counsel among Fortune 1000 companies. Of the men, eight are African American, five are Asian American, and three are Hispanic. Of the women, one is African American, two are Asian American, and two are Hispanic. With regard to industries represented on the Fortune 1000 list, utilities and healthcare-related enterprises make the strongest showings. All but one of the publishing companies that were featured prominently in 2006 have left this year’s list (and the remaining company, E.W. Scripps Company, has been reclassified as part of the “entertainment” industry). Results by region for Fortune 1000 general counsel of color reveal the only concentration of positions to be in California, with five general counsel. People of color who work as counsel for Fortune 500 and 1000 companies continue to be an elite group in regard to education and work experience. Among the Fortune 500, three general counsel had clerked for Supreme Court Justices. In this year’s group, 23 of the 37 minority counsel took their positions after being promoted in-house or hired from another corporation. Although many still had law firm experience, it appears that that experience did not serve as the closest stepping stone to becoming general counsel. 1. See Shawn Tully, “A Profit Gusher of Epic Proportions,” FORTUNE, April 15, 2007, at money.cnn.com/magazines/fortune/fortune_archive/2007/04/30/8405391/index.htm. 4. Within the Fortune Global 500 published on July 23, 2007, Chevron Corporation is number 7, Cardinal Health, Inc., is number 51, and AmerisourceBergen is 89. See the full list at money.cnn.com/magazines/fortune/global500/2007/full_list/index.html. 5. For the complete list of top performers, see money.cnn.com/magazines/fortune/fortune500/2007/performers/companies/growth_in_profits/1yr.html. 7. Published information was not available on the background of one general counsel.